Oceanic Agriculture is a marine strategy for rapid deployment of food-aid in times of prolonged civic stress. 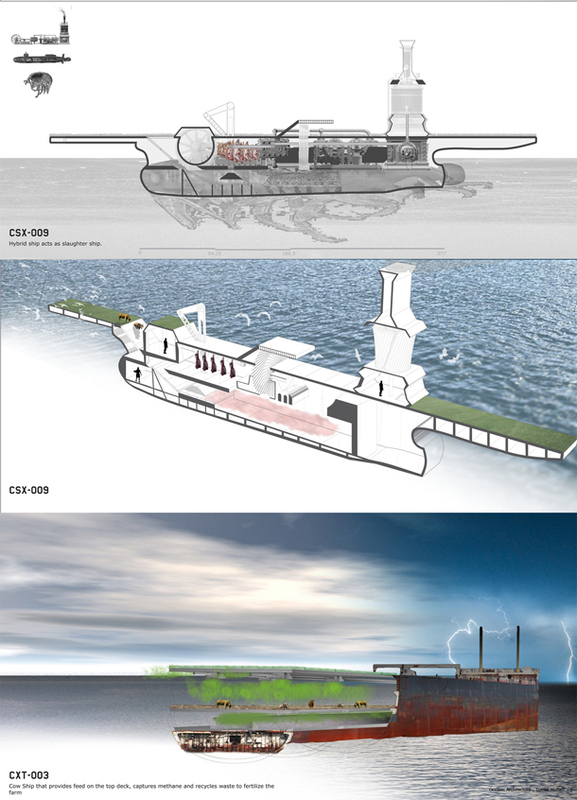 The design proposes to generate a flotilla of horizontal surfaces that become deployable seafaring farmlands. Oceanic Agriculture pairs the exigencies of organizations such as the World Food Program and the Global Food Crisis Program, with current disposal and mothball strategies for large military, commercial and private maritime vessels. Traveling and operating in international waters, this new aggregate territory breaks free from governmental control by any one nation. Once moored, the fleet loses and gains more or less “land” depending on season and cultural diet. Smaller ferries and feeder boats transport bounties between coastlines and supply decks. Through aggregation, the singular fields become a farm – the farm increases in scale toward the city and the city begins to constitute a free-range nation. This project utilizes two current infrastructures to produce a farm that is capable of being deployed at a moments notice in times of emergencies. In time such tools of this magnitude centered on the use of cows could potentially lead to a birth of new nations. These nations would not be bounded by the edges of the land that they are founded on, but infinitely based on their collection of obsolete ships. Countries would arise from hunger and a desire to be self-sustainable producing a fruition of smaller nations states seeking out the basic necessities of life: food and shelter. During World War II, Raoul Wallenberg actively produced diplomatic ties between those in need and the promise of shelter on “new” land. Part business, part politics, part architecture, and 100% noble, his plans literally worked wonder. Oceanic Agriculture works similarly. 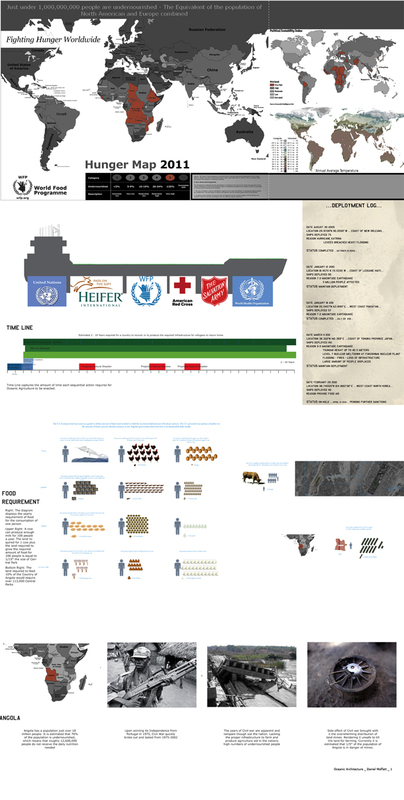 It looks at rapid deployment strategies for providing food-aid in times of prolonged civic stress. Whether the result of natural events, political isolation, or civil conflict, the loss of available food sources devastates both national and personal identity. I, me, we should do/be more in response to this. This is my plan for nutritional “occupancy”. EMERGENCY #2012_07: Angola, – a nation in civil war for 27 years, has had its infrastructure destroyed and its land littered with left-over, deadly, land mines. To farm is to risk one?s life and having little infrastructure to provide for irrigation, raising crops is increasingly hopeless as arable land borders on extinction and agricultural know-how fades. ACTION: Oceanic Agriculture pairs the exigencies of organizations such as the World Food Program and the Global Food Crisis Program, with current disposal and mothball strategies for large military, commercial and private maritime vessels. From this pairing, the big idea is to organize, design and generate a flotilla of horizontal surfaces that become deployable seafaring farmlands. Traveling and operating in international waters, this new aggregate territory breaks free from governmental control by any one nation. 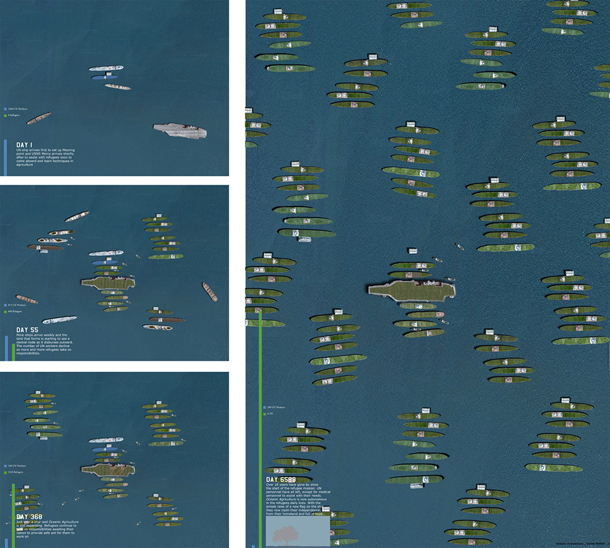 Once moored, the fleet loses and gains more and less “land” depending on season and cultural diet. Smaller ferries and feeder boats transport bounties between coastlines and supply decks. Housing freighters accommodate workers and agricultural trainees alike. 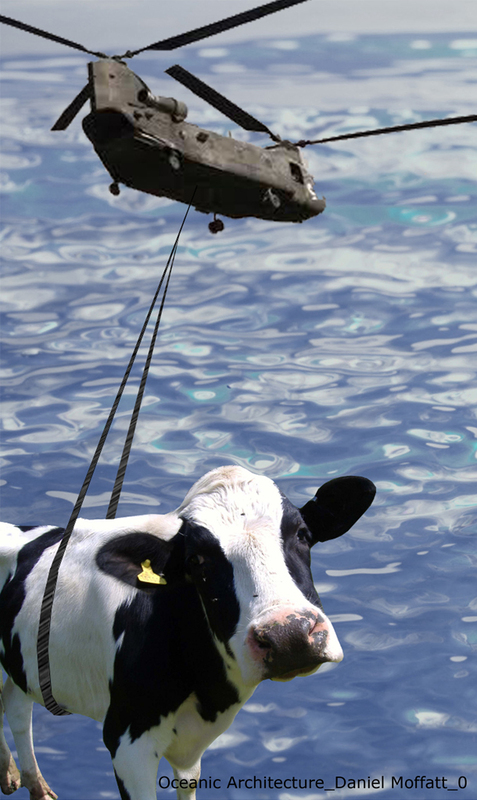 Cows provide much needed labor and fertilizer with the use of composting frigates and waste treatment vessels to become part of the temporal territory. The cow becomes the central focus of the flotilla farm by providing needed nutrients to the farm and producing methane that is captured and utilized as energy. Through aggregation, the singular fields become farm. The farm scales toward the civic and the civic, threatens to constitute a free-range nation. In the end, ideology is at work and “Angola” may literally be on the move. Daniel Moffatt graduated with a B.S. 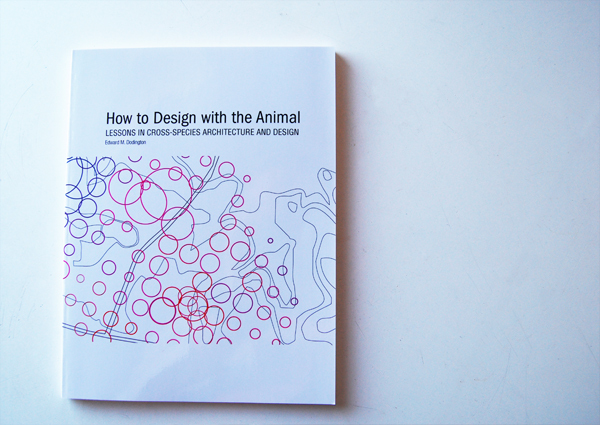 Arch in 2012 from Taubman College of Architecture and Urban Planning at the University of Michigan and is currently starting the master’s program at U of M. His interest in animal architecture is to utilize animals in humane manors that capitalize on their natural living conditions to incorporate into green design.